Random Noodling: Poetry Friday--"Pictures of Liberty"
Such a poignant poem, Diane. Your use of juxtaposition between then and now says so much so succinctly. Oh, wow. Sally's word "juxtapose" is the perfect one. I'm always in awe at the pictures you find, and then what you make with/inspired by them! 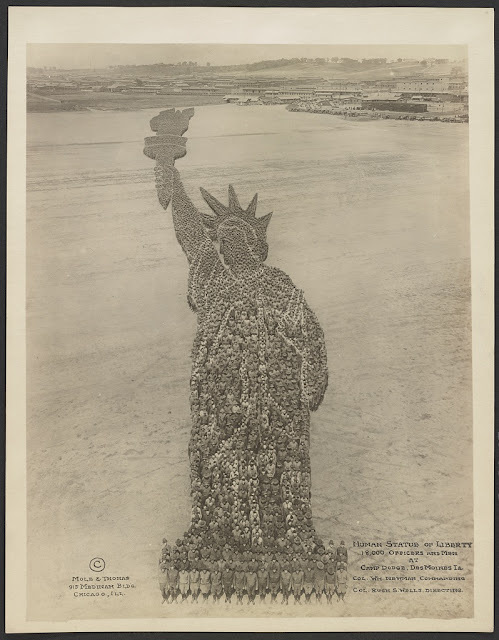 I love the Library of Congress digital collection of photographs. Our tax money at work in one of the best ways--enlightening us and helping us understand our history. Ditto on what Sally and Mary Lee said. In addition, your research provided another level of information I did not know. Thank you for sharing the back matter to your poem, Diane. Curiosity is a driving force for me, Carol. I'm amazed you found this photo and serendipitously this event took place 100 years ago. Strong poem Diane–I'm glad you wrote it and shared it with us. Aren't we lucky that photography existed back then and that the photographers put themselves in a position where they could capture the scale of it. Of course, you're right, Heidi, but some days the blame is so widespread that Lady Liberty has to stand in. Those last two lines, how well they capture where we seem to be at the moment, under this current "leadership". That's a fascinating photograph, too. Powerful photograph and response poem, Diane. Thanks for sharing. I look forward to seeing the others once they've been appreciated by their recipients.